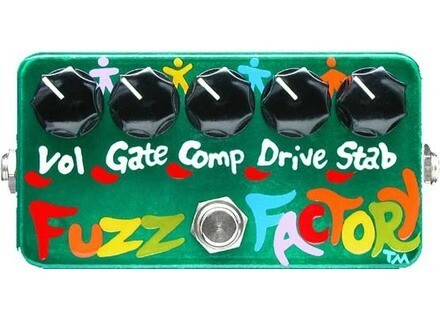 Fuzz Factory, Fuzz pedal from Zvex. This is a tube distortion pedal, similar to the original distortions by Electro-Harmonix and Germanium. This pedal comes with a power supply, and has two 1/4" jacks for input and output. It isn't rackable and can't be edited with a computer or controlled with MIDI. This is a relatively easy pedal to use, and it gives you a pretty wide variety of tones to choose from. There are five knobs which control the timbre of the sound. There are knobs that control volume, gate (the noise gate that comes built-in), compression, drive (similar to gain), and "stab" (which I don't have a technical explanation for other than it stands for Stability). Stability is basically the amount at which your signal (the fundamental tone) cuts through the mix. Stab is what allows you to have a more passive fuzz or a more in-your-face, physically present distortion. Between these five knobs, there is a ton of control to be had with this pedal, though be forewarned; only really heavy sounds are coming out of this guy. The sounds that come out of this thing are wild, extreme distortions. I use it with my Fender Strat and I have to make a lot of use of the noise gate in order to even get it to work. When it does though, it sounds incredible, especially for leads. I like using it with my Les Paul as well, since that guitar is better for really rocking out anyway. The range of sounds is pretty drastic for a pedal that is so uniformly heavy. This pedal ranges from newer sounding alternative/hard rock rhythm tones to classic Zeppelin-esque rhythm tones. I particularly like how much my tone can end up resembling that of Neil Young when playing with Crazy Horse. That sound is enormous and heavy while still being clear, and that's one of the great things about this pedal. Different setting will accentuate different overtones, making the capability of producing interesting noises pretty easy. I think that this is definitely a pedal for someone who explores heavy rock predominantly. I don't think blues/rock or folk-rock players would be too crazy about this pedal. But for those who are interested, this thing is pretty amazing. I'd highly recommend this pedal to any really heavy rock fan, or someone who's really into distortion in general. This is sort of comparable to a big muff, but it's got a lot more control and arguably superior tone (I'm still not sure which pedal sounds better). This thing is kind of expensive, about $300 new, but I'm sure you could possibly find a used one around somewhere. It's definitely worth the price considering how transcendent some of the effects are on this thing.